What are the general and distinctive features of the Division Coniferophyta? They have secondary growth whose thickening can be observed in cross section of a stem revealing annual rings. Secondary Growth is the result of growth Lateral Meristems (Vascular Cambium & Cork Cambium). Most of the members of Coniferophyta live in cool climates where they form evergreen forests. They keep their leaves year-round. They have a large amount of internodal elongation which allows them to grow faster than the other higher plants. They are Xeromorphic, a characteristic that help to protect them from excessive loss of water and therefore adapt survival in extreme habitats. Most are large trees while a few are shrubs and other small plants. Most of them have hard barks which protect inner softwood. Conifers are non-flowering but seed producing plants. They have seeds born in cones shaped structures rather than in fruits. They are gymnosperms which mean naked-seed plants because they produce seeds in cones rather than inside an embryo. The leaves are needle-shaped and have a thick cuticle for protection and to decrease water loss. Pines are evergreen, coniferous resinous trees growing 3â€“80 m tall. The bark of most pines is thick and scaly. They have needle like leaves. The Stem:The bark of most pines is thick and scaly, but some species have thin, flaking bark. The branches are produced in regular whorls appearing like a ring of branches arising from the same point. Leaves:A cross-section of pine stem has several concentric rings with distinct borders between each ring. The center of the stem is called pith. These rings are called annual rings because they grow seasonally and they help a plant to undergo secondary thickening. Generally adult pines have needle-shaped leaves which are green and photosynthetic. The leaves are in bundles or clusters. The leaves (cotyledons) on seedlings are borne in a whorl of 4â€“24. Juvenile leaves, which follow immediately after seedlings, have single, green leaves arranged spirally on the shoot. They also have non- photosynthetic scale leaves, similar to bud scales. They are arranged spirally like the juvenile leaves. Conifers are very important for our economy because of their softwood, which is used for paper and timber, as well as cedar which many people use for their homes because of its beauty and resistance to insects. They have a large economic use as softwood in furniture. In temperate and tropical regions, they are fast-growing softwoods that will allow harvesting in close succession. Decoration and ceremony Many pine species make attractive ornamentals. They are planted in parks and larger gardens. Some varieties are suitable for smaller spaces. Pines are also commercially grown and harvested for Christmas trees. As medicine, Pines and cypress are rich in vitamin; their branches cones and oils can be extracted and used as nutrient supplements. Due to its soft texture conifers are widely used to manufacture Play wood. As other higher plants conifers are source of heat energy, used as firewood and charcoal. Thick forests of conifers form green belts that modify the climate. Conifers form a large arena for Biological research Ecological studies. Food uses: Some species have large seeds, called pine nuts that are harvested and sold for cooking and baking. The soft, moist, white inner bark (cambium) found clinging to the woody outer bark is edible and very high in vitamins A and C. It can be eaten raw in slices as a snack or dried and ground up into a powder for use as bread flour. Also White Pines are rich in Vitamin A and C; flour can be made from the Pine tree's inner bark. By chewing bark of pine you can eliminate bad breath. Pines can reduce the pain of skin infections by applying warm pine sap. Angiosperms are flowering plants under kingdom Plantae and division Angiospermophyta. This group of plants is sometimes called Magnoliophyta. Angiosperms are the most abundant land plants. Like gymnosperms, angiosperms are seed-producing plants but they are distinguished from gymnosperms by their characteristic of producing flowers. These plants produce fruits that contain seeds instead of cones like it is in gymnosperms. The term angiosperm means a plant that produces seeds within fruits. Angiosperms life cycle:The ovary has ovules that contain mega-sporocyte. Mega-sporophyte has four haploid megaspores; three megaspores disintegrate and the remaining one divides by mitotic divisions to produce eight nuclei in an embryo sac. The three nuclei are organized into the egg whereby one cell is the egg cell; the two others are egg helpers. Although these three cells look are similar, only the egg cell continues to develop to an embryo sac. The embryo sac at this stage is the female gametophyte or mega-gametophyte. Pollination and fertilization:The pollen from the anther is transported to the stigma of a flower. In the stigma pollen tube emerges. The mature male gametophyte therefore is a germinated pollen grain, pollen tube and three sperm nuclei. The pollen tube grows downward toward the ovary through the style and penetrates the embryo sac. After discharging its contents one of the sperm nuclei fuses with the egg nucleus and form a zygote, the other sperm fuses with the polar cell of the ovary, forming the endosperm nucleus. This is what is known as double fertilization. Fertilization in angiosperms begins very soon after pollination. Note: In gymnosperms, fertilization can occur up to a year after pollination. Double fertilization:Double fertilization is a distinctive characteristic of the angiosperms and results in a polyploid endosperm tissue. In double fertilization each ovule receives a pollen tube that delivers two sperm cells to the embryo sac. One sperm fertilizes the egg cell to form the diploid zygote, while the other sperm fertilizes the central polar cell to form triploid endosperm. After double fertilization, the ovule develops into a seed and the ovary into a fruit. They bear flowers which are reproductive structures. Fertilization takes place between male and female flower by pollination that includes insect pollination, wind pollination and animal pollination. Angiosperms have underground root as well as aerial shoot system. Angiosperms have very well-developed conducting tissues. These tissues include the xylem and the phloem arranged in form of vascular bundles. They have root that helps absorption of water and minerals from the soil. Most of them have leaves that carry out photosynthesis, so they are autotrophs. They have alternation of generation, Sporophyte generation alternate with gametophyte generation. The sporophyte is the dominant, diploid stage and is the more visible form of the plant, with the leaves, stems, roots, and flowers. Gametophyte generation is reduced and it is found within the ovary and anther. The most obvious distinguishing feature of angiosperms is the possession of reproductive structures called flowers. They bear seeds enclosed in a carpel (the fruit). The seeds are the fertilized ovules. They have endosperm produced after fertilization and before the zygote undergo its first division. Endosperm has nourishing function, it nourishes the embryo. They have double fertilization whereby each ovule receives a pollen tube that delivers two sperm cells to the embryo sac. One sperm fertilizes the egg cell to form the diploid zygote, while the other sperm fertilizes the central polar cell to form triploid endosperm. Their haploid gametophyte is confined inside the ovary (female) or anther (male) of the flower, unlike the free- living gametophytes of most other plants. They have conducting tissues phloem and xylem. Unlike gymnosperms which have xylem tracheid angiosperms has xylem vessels. Division Angiosperms is divided into two classes which are Monocotyledonae and Dicotyledonae. These two classes are distinguished from each other by their morphology and anatomy. Monocots have broad leaves with parallel venation. Monocots have fibrous root systems. The floral parts in monocots occur in threes, or multiple of three. PMonocots lack cambium secondary growth. Monocots have scattered vascular bundles in their stems.Typical example of monocot is a maize plant. 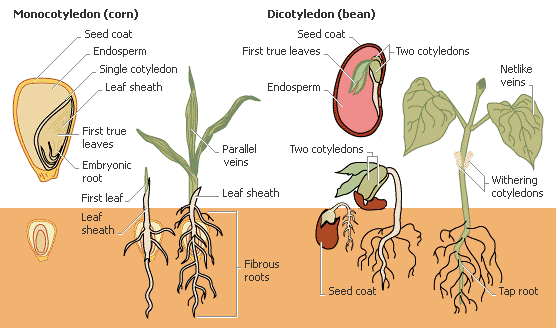 Dicots have two cotyledons (or two seed leaves). Dicots floral parts occur in fours and fives and multiple of four or five. Dicots have cambium secondary growth. Dicots have vascular bundles arranged into a ring. A Typical example of dicot is a bean plant. Agriculture. Agriculture depends on angiosperms. Angiosperms provide human food. Example; plants belonging to grass family (grains), are the most important food stocks. They include rice, maize, wheat, barley, millet, sugar cane and sorghum. Legume provides beans, several varieties of nuts and soy. Also of potatoes, tomatoes, and peppers, pumpkins, melons and varieties of vegetables to include cabbage and lettuce. Many fruits oranges, lemons and grapefruits are angiosperms. Livestock. Plants belonging to grass family are the world number one feeds of livestock. Many types of grassland in Africa are either grazed by cattle or wild animals. Also almost all feeds consumed by human are also used by domestic animals as food. Wood. Angiosperms provide different varieties of wood for furniture, paper and building materials. Carpentry and masonry depends largely on angiosperms for both soft and hard wood. Textile. Different varieties of fibers including cotton, flax, and hemp are important raw materials for textile industry. Cotton is the word first class material for clothes. Medicine. Many organic drugs are coming from angiosperm herbs. They are either industrial made or can be utilized in its raw form. Today it is believed that herbs form the best medicine when used in their fresh form than when industrial made. Floriculture. Flowers from angiosperms have great social significance as they are used in different kinds of ceremony. Roses for instance are the most sold flowers and they are highly purchased and used in wedding and burial ceremonies. Forestry. Forestry is the field of study whose base depends on both angiosperms and gymnosperms. Many forests form green belts that habit different varieties of plants. Ecology. Angiosperms provide a wide range of habitats for different species of organisms. They also serve as primary producers of energy. Climate. Angiosperms are used to modify climate. Green belts are established in order to absorb carbon and reduce global warming. Tourism. Many sites of tourism are plants oriented. Ecotourism for instance depends largely on different plant species that host different kinds of land animals. Toxins. Some plants are poisonous when eaten by human and other animals. They cause death to human and other living organisms. Some cassava varieties are a good example. They have cyanide acid that inhibits cellular respiration. Drugs. Some angiosperm varieties are drugs that can be abused when taken. Examples are marijuana, cocaine, tobacco and some caffeine varieties. Weeds. Some angiosperm varieties are bad weeds; they reduce crop yields. Some weeds are parasites. Example, Cuscuta kilimanjari is parasitic to coffee plantations. Movement refers to change of position and posture. Therefore the change of position of body parts such as limbs and other body parts. Locomotion is the movement or change of position of the whole organism from one place to another. But normally organisms have different kinds of movement. Plants show movement but do not show locomotion. 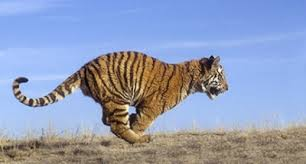 Since locomotion involves coordination between nervous muscular and skeletal system and all these system enable the organism to locomote. Bones are classified in to long, short, irregular bones and flat. Short bones these are short bones, which support weight allowing for many smaller movements. Example bones on the human feet. Long bones these are strong, hollow and light containing spongy bone at the end. And spongy bone has open space and holes, which contain red marrow, which is where red cells are made. Example bones on the legs and arms. Flat bones these are bones, which support and protect body organs, these comprises ribs, breastbone, shoulder bones etc. Irregular bones these bones are for support and such bones are vertebrae also human ear has three tiny irregular bones, which conduct sound. 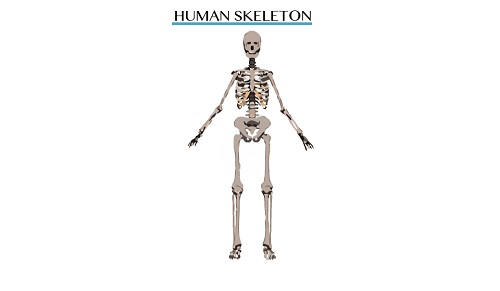 The human skeleton has about seventy movable joints. A muscle is a tissue consisting of cells that have the capacity to contract and exert a pull. 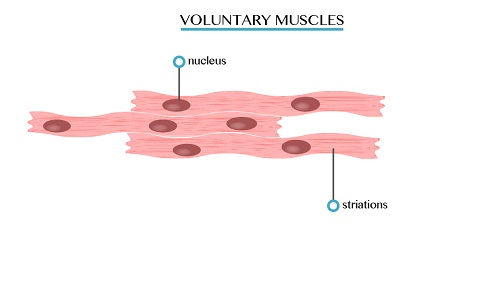 Muscles are made up of specialized tissues, which are known as contractile tissues. When these tissues contract they become shorter and tighter, as a result they cause movement. 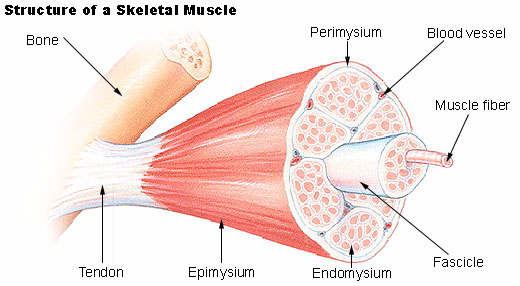 All muscles are made up of elongated cells called muscle fibers. There are three kinds of muscles in the body of a mammal. These muscles are skeletal muscles (voluntary), smooth (involuntary) muscles and cardiac muscles. At one point a muscle is usually attached to an immovable bone and other end to a movable bone. Muscles can contract and relax, but not expand when muscle contracts it becomes shorter and thicker and hence, exerts a pulling force on bone to which it is attached at a point of insertion. 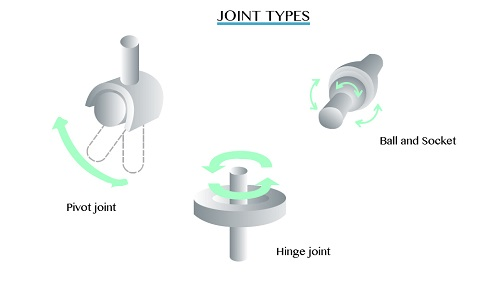 The figure below shows how the two muscles of the upper arms that is the biceps and triceps muscles bringing about the bending and straightening of the limb. 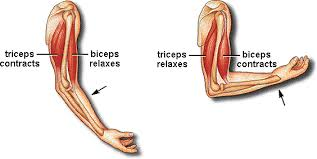 When the triceps (extensor) muscle contracts the limb is straightened. The contraction of the triceps is accompanied by the relaxation of the biceps (flexor). When the biceps muscle contracts the arm bends. 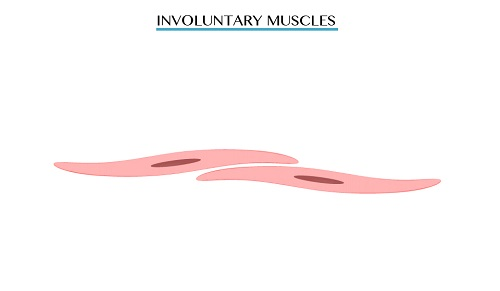 Smooth (involuntary) muscles are found on the walls of internal organs such as alimentary canal, blood vessels and bladder. The smooth muscles, which are formed in different organs contract and relax to cause movements of materials through them. Example: peristalsis in alimentary canal causes movements of the materials through the canal with the help of smooth muscles. This is the type of muscle, which is found only in the heart. These muscles are made up of muscle fibers which branch and connect to each other like a network. A muscle cramp is an involuntary and forcibly contracted muscle that does not relax. The cramp may involve a part of muscle, the entire muscle or several muscles that usually act together. Any of the muscles that are not at our voluntary control can cramp. Sometimes it occurs when the body lacks salt especially for those people who work hard in hot weather they sweat a lot and get painful cramps in their legs, arms or stomach. Applying a soft massage on the cramped muscle, stretching the muscle and applying oil ointment on the affected area, can treat a muscle cramp. Generally plants do not show locomotion (movement of the entire organism). However, movement of individual plant organs is possible and modified by sensitivity of the plant to external stimuli. Plant movements in response to internal stimuli are known as spontaneous movement. Examples of these movements are metabolic conditions, disease conditions, vex ages and parental influence Those movements shown by plants in response to external stimuli are known as induced or irritablemovements. Induced or Irritable Movement is the type of plant movement shown by plants in response to external stimuli. Light, temperature, gravity, touch, water and chemical substances are examples of induced movement. 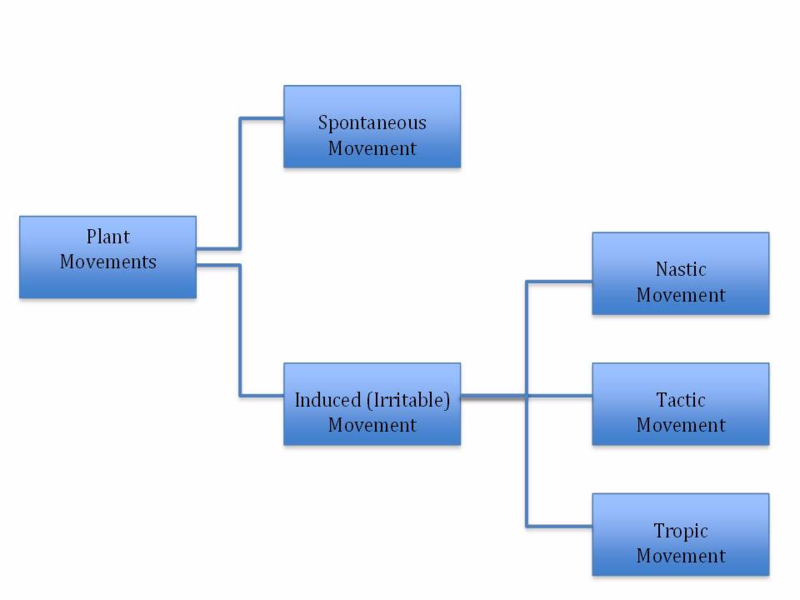 Induced movements include nastic movement, tactic movement and tropic movement. A summary of the types of movements shown by plants in response to stimuli. Tropic movements are the growth movements shown by a fixed part of a stationary plant towards or away from a stimulus coming from one direction. Tropic movements are also known as tropism movements. Tropic (tropism) is growth movements, which take place at a very slow pace. The growth movement is caused by an increased or decreased rate of growth on the side of the organ, which is under the influence of the stimulus, with respect to the opposite side. This results in growth in curvature. 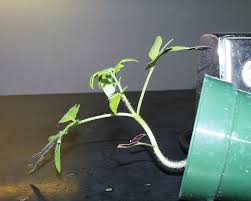 Thermotropism (Thermotropic), a growth movement shown in plants in response to heat.